Explore these small religious buildings that bring so much charm to our countryside. BOUREZ chapel, built in red bricks and covered with slates, it contains the statue of the Blessed Virgin of Lourdes, but especially a statue of Saint Apollonia that we pray for some relief to toothache. RYSSEN chapel is dedicated to Our Lady of Graces and was contructed by Gustave RUYSSEN. Built in red bricks, it is covered with slates and houses a statue in it, which was formerly walked in procession at Peronne in Melantois. LOYWICK chapel dates from 1955. It was erected by the LOYWICK family and was blessed on August 15, 1955. It is among others, destined to desperate causes. ROBYN chapel dates from 1981, it was erected by Mrs Mrs Bertina ROBYN who had made the wish at the age of seven and was able to make it a reality following a winning at a game. The 4 winds chapel it would date from 1925. Small wooden chapel on a pole, it holds 4 small statuettes. Dedicated to Our Lady of Lourdes, it was built by Abel DESCHODT, last owner of the mill of Wormhout. The COCKEMPOT Chapel dates from 1904 and was edified following the loss of the farm animals. Built in yellow and red bricks, it is a Flemish style and is maintained with care by the COCKEMPOT family. The MOUCHIE Chapel dates from 1746 and is dedicated to Saint Apollonia. It bears on its pediment the three dates of construction and successive restorations: 1746, 1862, 1930. We came here to preserve the animals from cattle plague. 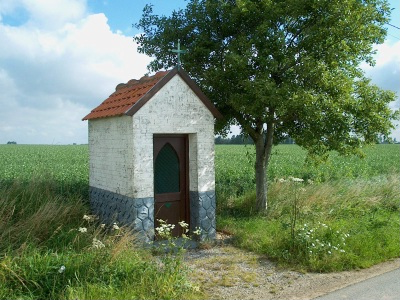 The DEBAVELAERE Chapel dates from 1930 and is dedicated to Saint Apollonia and Our Lady of Lourdes. Built at the initiative by Baron Bernard of VILMAREST, in thanks for having preserved the farm of the destruction of the 1st World War. The Chapel of Our Lady of Lourdes dates from 1842 and as the name suggests, it is dedicated to Our Lady of Lourdes. Its construction being prior to the events of Lourdes, one can wonder for which saint this one had been initially built. The KRUYSTRAETE Chapel, whose date of construction is not known, was recently moved with the construction of the business area. We come here to cure toothaches? LABAERE Chapel whose date of construction is also unknown, but the farm dates back to 1850. It is dedicated to Our Lady of Lourdes and Sister Therese of the Child Jesus. If you wish to discover these chapels in an original way, these are visited by horse drawn carriage in July. Our guide will explain in more details the history of these chapels and their owners.